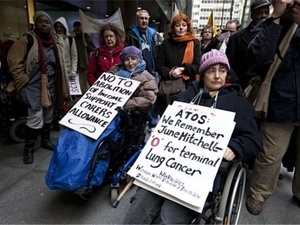 A week of action in defence of the rights of disabled people kicked off on Monday with a protest outside the headquarters of Atos Origin, the private company with an £80m government contract to assess whether those on disability benefit are 'fit to work'. Changes introduced by the Department for Work and Pensions in February mean that everyone currently on Incapacity Benefit is being moved to Employment and Support Allowance (ESA). To get ESA claimants are being forced to undergo stringent but often completely inaccurate medical tests. Atos has already been criticised by a number of charities as providing 'flawed' and 'inadequate' assessments, where doctors report ' incorrectly what the claimant has said about their own conditions and...pay more attention to the computer'. This has led, say protesters, to 69% of claimants being forced off ESA and onto the lower-rate Jobseeker's Allowance, or off benefits altogether. Overall, it is estimated that disabled people will be hardest hit by proposed cuts in benefits and services, with them and their families losing £9bn of support over the next four years. "We're here today to challenge all the benefit cuts which will lead to the most vulnerable being drawn further into poverty, and we're here to challenge Atos Origin who carry out the eligibility testing for benefits on behalf of the DWP, using methods which have led to people with terminal illness and severe disabilities being found 'fit to work'." On Wednesday, thousands of disabled campaigners and their supporters will converge on Westminster on the Hardest Hit march organised by hundreds of charities and community groups. Join them at 11am on Victoria Embankment.